Planes hit the towers 4 years, 6 months and 22 days ago. And the story still hasn’t quite been told. Please, will someone explain to me why all this time later, we are still struggling to fill all these blanks? Today, we will get a few more details from that horrendous morning so long ago; one-sided conversations with 911 dispatchers in the first frantic moments after the terror attacks. We almost didn’t get this much. Were it not for Sally Regenhard and the determined efforts of a few other relatives of the men and women killed in the Sept. 11 attacks, we’d be guessing about even more. Regenhard lost a son, Christian, a probie-firefighter in Brooklyn, and she has a straightforward approach to 9/11 analysis: She really would like to know the truth. What choice does any of us have but to confront it? Now some parts of the story of Sept. 11, 2001, may never be fully told. The twisted motives of hijackers. The geopolitics of it all. The never-ending strategizing over how America and the world should respond to terrorism. All that, we’ll be debating for centuries – and properly so. But there is simply no reason to continue to withhold the full extent of what happened there. The simple rudiments. The actual historical record. The who-what-when-where-and-why of 9/11. It’s the most important narrative of modern America. It must be told in all its intricate and horrible detail. Actually, we’ve done OK on the when and the where of the terror attacks. But here we are, all this time later, still grasping for the rest. So today, the families are steeling themselves for another small data drop, a few new snatches of audio, another load of human drama, one more handful of factual crumbs. So are the rest of us. And yet lawyers representing the city of New York and its Fire Department – even some 9/11 relatives – don’t want the full truth to come out. They say we know enough already. They say we have the general idea. They say we don’t need to know any more. They’ve been in court, working hard to ensure that we never do. This time, the issue is tape recordings of phone calls to the 911 dispatchers and fire operators from people inside the Twin Towers just after the planes struck. The tapes have been locked in a vault all this time. It’s what historians call “original source material,” and it is the first building block of long-term perspective and deeper understanding. The few snatches that have leaked already point to a contribution that cannot be ignored. Why was it hidden so long? Do the tapes reflect poorly on some aspect of the 9/11 response? We’ll learn more about that today. But wouldn’t it have been so much kinder to the families – and so much more honest to the rest of us – if these tapes were made public years ago? Whatever wounds they reopen today – and they will reopen some – at least it would have happened more quickly than it did. Maddeningly, the city lawyers were back in court this week, still trying to limit the release. They were, to put it more bluntly, trying to limit the truth. 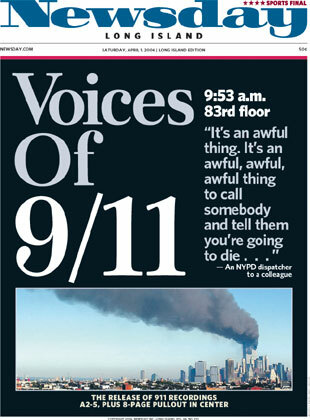 The terror attacks of Sept. 11 are still a story worth telling. If we don’t know what happened that day – really know – how can we ever learn the lessons it can teach? We’ll be another stop closer to that knowledge by the time this day is over. We could be so much closer still. The views expressed in articles at 911Truth.org reflect the opinion of the individual writer, and are not necessarily those of 911Truth.org or the steering committee.